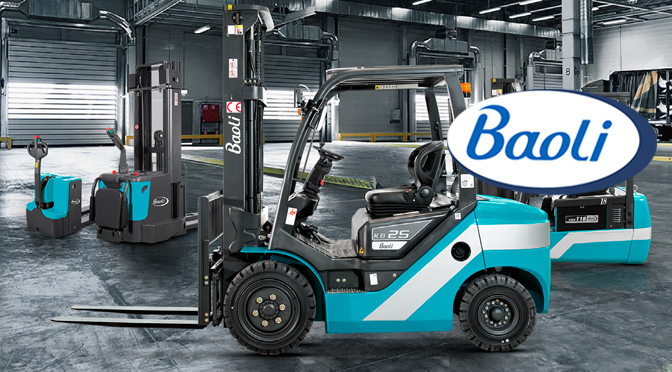 Through the agreement, Smith Power will add Baoli’s range of diesel, electric and LPG forklifts, as well as stackers and pallet trucks to its stable. KION Baoli is a brand of forklift trucks that was founded in China in 2003 and acquired in 2009 by the KION Group, the European market leader and the world’s second largest manufacturer of warehouse technology. In 2017, the KION Group went on to establish Baoli EMEA, a new organisation which replaced and expanded the previous Baoli structure in Europe, the Middle East and Africa, currently covering 26 countries, but with the ambitious aim of covering 86 markets in the region in just a few years. In South Africa, the brand is set to benefit from Smith Power’s knowledge of the market, as well as the extended branch and dealer network. To cater for a wide range of warehousing customer needs, Smith Power offers Baoli’s full range of diesel, electric and LPG forklifts. The diesel range comprises the KBD25 2.5T, KBD25+ 2.5T and the KBD35+ 3.5T. 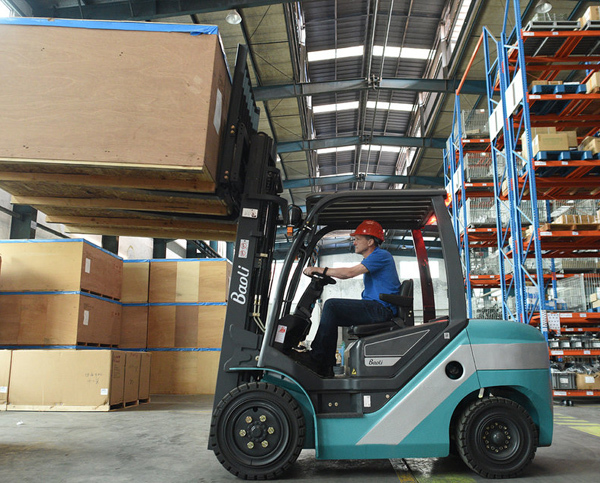 “The KBD+ series lift trucks are designed to provide high productivity and excellent performance. They are available in the diesel versions with 2 500 -3 500 kg load capacities and a powerful Xinchang engine,” says Tom Bloom, GM for Construction Equipment at Smith Power Equipment. Comfort is assured by the full suspended cabin which reduces vibrations originating from the ground. The large, spacious and easily accessible cabin is designed to guarantee maximum visibility, consequently increasing safety on site. The KBD+ is an extremely versatile product that lends itself to multiple uses. Great attention has been paid to lift truck maneuverability, in the first place guaranteed by the special reduced diameter steering wheel. Other important driving aids are the pedal parking brake, the electronic driving direction selector, the easily accessible hydraulic levers and the dashboard with multi-function display. The painstaking care taken in all the construction and design aspects is demonstrated by the particular shape of the counterweight, which increases safety, enhancing the visual impact when driving in reverse, as well as the ascent handle and rear handle with a horn activation button for comfortable reverse driving. 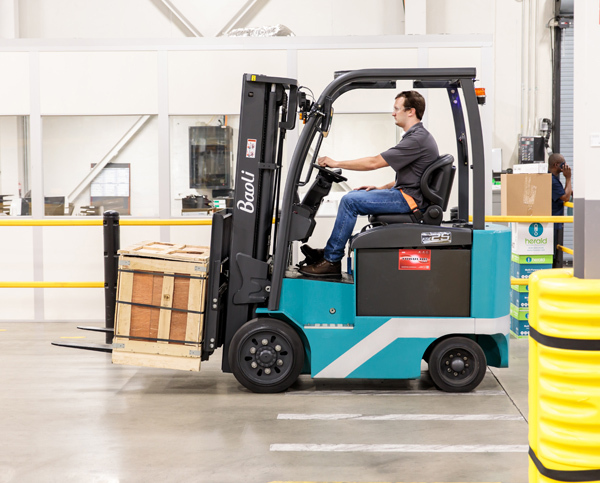 “All the KBD+ series lift trucks are equipped with hydrodynamic transmission supplied directly by the KION Group,” says Bloom. In the electric range is the KBE25 2.5T. 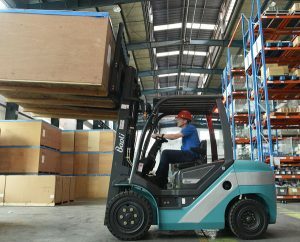 The four-wheel electric lift trucks of the KBE series with 48 V power supply guarantee greater productivity and economy. Available with load capacities of 2 500 kg, the range provides excellent handling and is equipped with automatic electric braking when the accelerator is released, thanks to the braking energy which is recovered and returned to the battery in the form of electrical energy. “Top class electronic components have been used. The traction and lifting motors are manufactured by Italian company, SME, a worldwide manufacturer of high-quality motors. 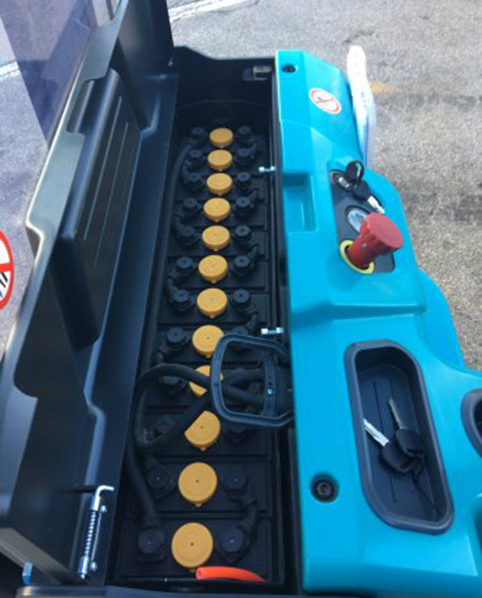 Also manufactured by SME is the electronic controller, the ‘heart’ of the lift truck, which accurately controls every lift truck function and provides the high performance this series is capable of,” says Bloom. All the KBE lift trucks are equipped standard with a curve speed reduction system and the main driving functions can be parameterised. The driver can directly choose between the various performance levels via the display, for example, selecting a reduced performance profile for more delicate handling and a more aggressive profile for yard handling. Meanwhile, the LPG range comprises the KBG25+ 2.5T and the KBG35+ 3.5T, with load capacities of 2 500 kg and 3 500 kg, respectively. The KBG25+ has a turning radius of 2 170 mm, while the larger KBG35+ offers a turning radius of 2 540 mm, allowing the machines to work well in space constrained jobsites. The pallet truck range comprises the EP12WS 1.2 T lithium-ion power pallet, the EP15-N01 1.5T electric basic power pallet, and the EP16-N01 1.6T electric standard power pallet. The EP12 is the entry model for the electric pallet trucks designed from the ground up to provide industry-leading tight turning radius for faster, easier pin wheeling, more work cycles and better bottom-line productivity. However, the major talking point is its 24V (20/26 Ah) lithium-ion battery offering high efficiency and life time duration. It offers three hours of continuous working with only one charge. With uptime in mind, it has a low charging time without memory effect – only 2,5 hours for a complete charge. A smart design allows easy removal of the maintenance-free battery pack for recharge. An optional 3,7 kg standby battery is available for extended run time. With a lift capacity of 1 500 kg, the EP15-N01 pallet truck is Baoli’s solution for all low- and medium-intensity transport situations. It is the ideal solution to speed up transport and shipping operations, even and specifically inside trucks. “The built-in battery charger ensures the best performance with high autonomy. The highly ergonomic drive tiller arm allows for safe controlling of the vehicle with one hand and it has a slow drive button to safely operate in the tightest spaces. It features a battery charge indicator with lifting cut-off function. Alternating current electronics guarantee high performance and greatly reduced maintenance. The forks are available in different sizes,” explains Bloom. With a 1 600 kg lifting capacity, the EP16-N01 pallet truck is ideal for loading and unloading from vehicles and for any type of medium-intensity handling. Thanks to its ultra-compact chassis, the EP16-N01 model is ideal for use in the tightest of spaces. 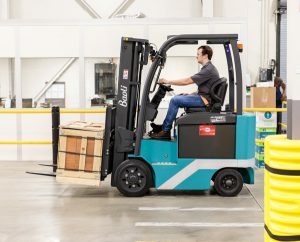 “High construction quality and high technological content make the pallet truck a real benchmark in its sector, guaranteeing maximum efficiency and reduced maintenance costs,” explains Bloom. The long tiller arm allows optimal and highly ergonomic control of the vehicle. In fact, it requires less operating force than pallet trucks with a short tiller arm and allows the driver to always keep an optimal distance from the vehicle. The stacker range comprises the ES10-N01 1T and the ES16-N02 1.6T. 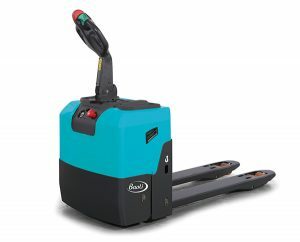 The Baoli ES10-N01 is a compact electric stacker powered by 2 x 12V 85Ah batteries. It can be used in a large variety of undemanding situations inside warehouses. 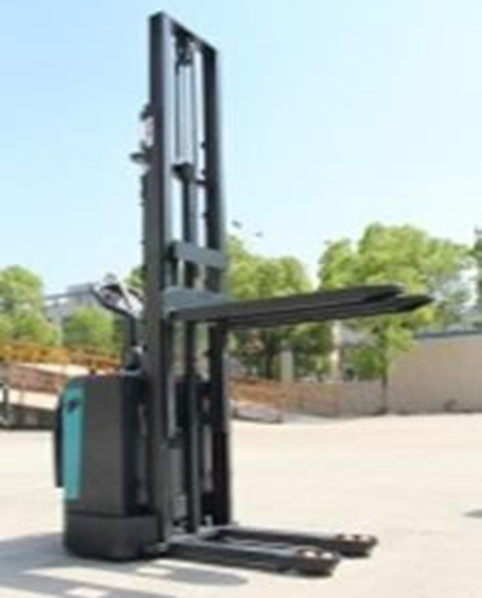 It has a load capacity of 1 000 kg and is available with lifting heights from 1 600 mm to 3 500 mm. It comes with four support points and tiller arm arranged sideways for excellent manoeuvrability. It features a battery charge indicator with lifting cut-off function. The lifting columns are designed to guarantee maximum visibility and high reliability over time. The forks are available in different sizes. 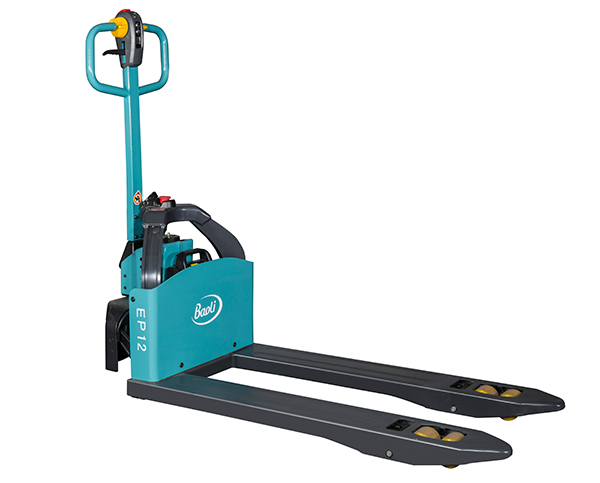 The ES16-N02 stacker range is ideal for transport and storage of loads from 1 200 to 1 600 kg. Thanks to the excellent driveability and the proportional operating controls, the stackers provide extremely high handling efficiency. “The long tiller arm allows optimal and highly ergonomic control of the vehicle. In fact, it requires less operating force than stackers with a short tiller arm and allows the driver to always keep an optimal distance from the vehicle,” concludes Bloom. This article was featured on ARB’s website Feb 2019 [click here]. This article was featured on African Petro Chemicals website Feb 2019 [click here].